Some furniture is single purpose. Some others are dual purpose. 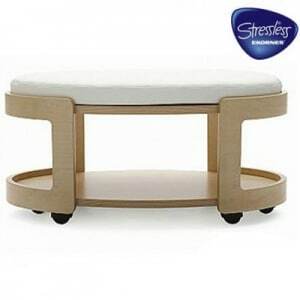 This Stressless Oval Ottoman is triple purpose! 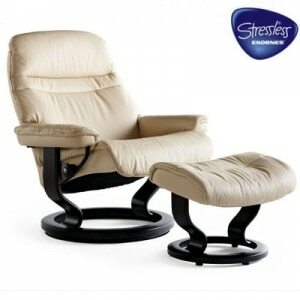 It serves as a comfortable extra seat for guests, a footrest to use for relaxing, and even as a coffee table! The attached casters allow for easy movement, and the top upholstered cushion can be placed either on top or on the lower shelf. Many wood finishes offered as well as many beautiful fabrics and top grain leathers. Why have one-purpose furniture when you can have triple purpose? 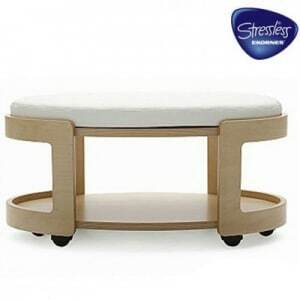 The Stressless Double Ottoman serves as a cocktail table, ottoman, and storage. 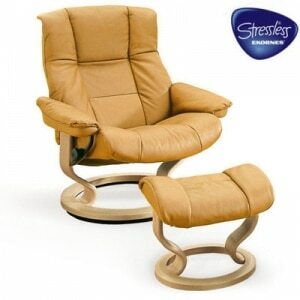 The top features two comfortable cushions for resting weary feet, yet lift and slide those cushions outward and add the wooden tray insert for a functional cocktail table. Under the top cushions is an ample hidden storage area to store extra blankets or the wooden tray when not in use. Convenient wheels on the bottom allow it to move throughout the room with ease. Choose from a wide array of beautiful fabrics and top grain leathers as well as several wood finishes. 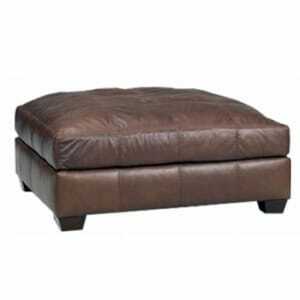 The Riley ottoman's substantial size makes it multi-purpose. Use it to rest your feet on, use as extra seating space, or add a tray and use it as a cocktail table. The low profile legs are done in a mocha finish, and choose from a variety of leathers and fabrics to customize to your design style. 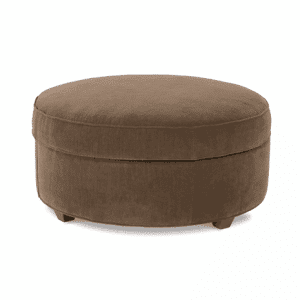 The Renee ottoman features a button-tufted cushion top, baseball stitch trim, and convenient casters. 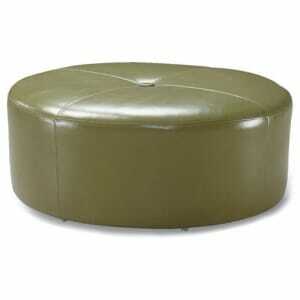 Its round shape can soften any room, yet with its ample size, it can easily be used as a coffee table. Many fabrics and leathers are offered! 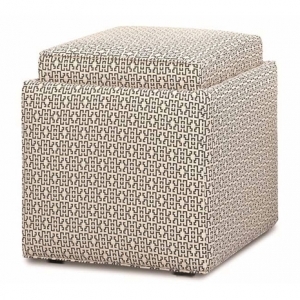 The cubed shape Nellie ottoman features a reversible top - one side is cushioned and upholstered, while the other side is an espresso finish wooden tray. Remove the top to find ample convenient storage, and hundreds of fabrics are offered! Proudly made in the USA! With its hinged upholstered lid which reveals ample storage for magazines, remotes, and blankets, the Henry ottoman is not only stylish but functional as well. Its streamlined tailoring is paired with low profile wooden legs. Many customizable options offered, including hundreds of fabrics and several wood finishes. 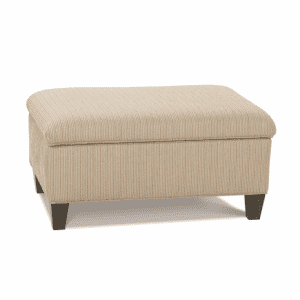 When the cushioned top is removed, an ample storage area is revealed in the Eerin ottoman. Its round shape can soften any room. Streamlined tailoring and low profile wooden feet complete the look. Many customizable options offered, including hundreds of fabrics and several wood finishes. 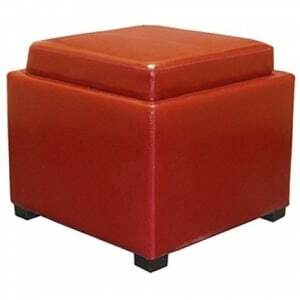 The functional Cameron ottoman is offered in a wide array of colorful leathers. Choose from either round or square. The top is upholstered on one side, and if you turn it over, you can use it as a wooden tray. Remove the top to also expose convenient storage space. 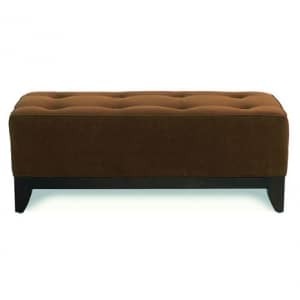 The Brook ottoman features button-tufted detailing on top, an exposed wood frame, and an elongated length, making it great place for everyone to put their feet up. A slipcovered version is also available. Many customizable options offered, including hundreds of fabrics and several wood finishes.